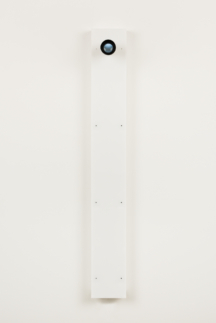 SELF F, a narrow rectangular form mirrors the human scale of a standing figure. Again a singular portal is witness to a plodding sequence of six images that run up and down the viewing viewer viewed—a self made abstraction. (See SELF ( ) series here for a more thorough description of the interplay between the individual SELF components).